Best Posts of the Week is one of two new member blogs chosen to be featured as part of the new share-the-readers program for BlogCoach Community members. Best Posts of the Week was started by Vicki of Not So SAHM, who "got tired of spending too much time surfing for great content and wanted it to come to her." 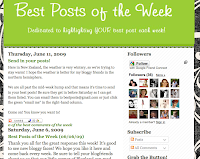 BPOTW is a blog dedicated to highlighting the best post of the week from participating bloggers. Each Saturday Vicki puts up a new list of "best" posts. Bloggers: you get more exposure where you want it most, your best post. Comments and new subscribers are sure to follow! Readers: you get great material consolidated into one place...the best posts come to you! You can read through them at your leisure and make new blogging friends. I'll select two new member blogs on Friday, September 26.